"I was very apprehensive to bring my 14-month-old baby to a Chiropractor. I could see early on when she started walking that something was wrong. She shrugged all the time, her shoulders were not even, she would squat funny and you could see a curve in her spine. My daughter's pediatrician set up an appointment with a pediatric orthopedist. After x-rays there was clearly a problem. The recommended treatment was to wait six months and come back to see if anything had changed. After serious prodding by my mother, I set up a consult with her Chiropractor, Dr. Amato. I brought her x-rays for him to see. Dr. Amato's plan was why wait?! The problem should be fixed now before she develops anymore. He felt very confident that within six months we would see results. Here it is, six months later and the results are amazing! We visited once per week initially and then every other week and now every three weeks. 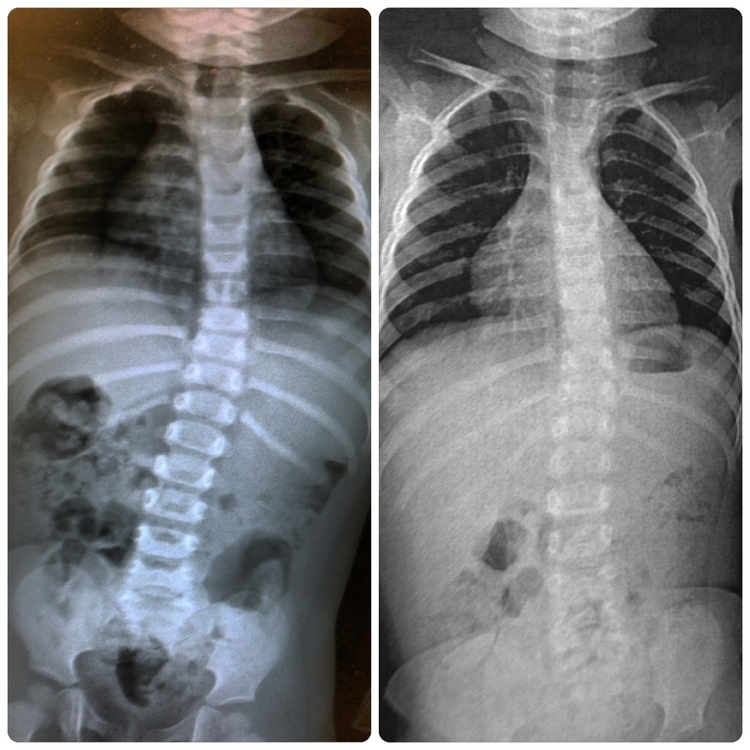 The before and after x-rays show amazing results! My baby no longer shrugs, her shoulders are almost even, and she squats correctly, and you can no longer see a curve in her spine! My baby loves Dr. Amato! He is so gentle and patient. My daughter has no problem sitting still for her appointments even though she is a very active child. I am a believer in Dr. Amato and in Chiropractic care. The staff in the office greet my baby like she is family. Everyone is so kind and child friendly. If you see a problem, take my advice and see Dr. Amato." "I've been to five Chiropractors and none of them have helped me as much as Dr. Amato has. He is a miracle worker! I have suffered from lower back pain for over ten years and Dr. Amato and his staff(they have Physical Therapy too!) have helped me to gain my life back. With the tools and knowledge to keep my condition manageable and under control, I am able to live the active lifestyle I want and be able to play with my grandkids!....and I also have the reassurance that if I'm having a really bad day, I can call the office and Meagan will get me in right away for an adjustment! If you're looking for a great Chiropractor or Physical Therapy Clinic, go with these guys! You will not be disappointed!" "Before I was under the care of Dr. Amato, I had been suffering from pain and fatigue for months on end. I had been to several Medical Doctors and specialists who didn't have any answers for me. At that point, I had decided to try a more holistic, alternative approach to healthcare. I could not have been more pleased with my experience at Wareham Chiropractic & Wellness. Dr. Amato and his staff are very welcoming and extremely accomodating. Within a few short weeks, the pain that had been holding me back from living my life had significantly diminished and even more importantly, I had an answer as to what was the source of my suffering. Dr. Amato had insisted I get tested for Lyme disease. The doctors I had seen previously had ruled that out early on and told me that I didnt fit the bill for this diagnosis. I requested that my primary care physician order tests for Lyme disease. He was shocked when the results came back positive. I was sure to let him know that it was my Chiropractor that had caught it. It's a shame that some people think Chiropractors aren't of the same prestige as Medical Doctors. Dr. Amato has my full trust and I value his medical expertise and guidance in my achievement of my healthiest potential." "As a public safety professional for close to 20 years, I have had several recurring back and neck problems. I became a patient of Dr. Amato in February of 2014 and have never felt better. Dr. Amato and his staff are kind, courteous, and very professional. They go above and beyond to make themselves available at a moment's notice to schedule a last minute appointment after a long shift at work. I am also a client of the Ideal Protein Diet which is a medically supervised weight loss program that Dr. Amato oversees. I have had great success with this program and am looking forward to a future of better health with all the help of Dr. Amato and his team. I highly recommend Dr. Michael Amato and Wareham Chiropractic & Wellness for your Chiropractic, Physical Therapy, and diet needs." "The Ideal Protein Diet has worked for me like no other diet I have tried. I have been on several different ones over the past few years. Losing the weight has never seemed to be the problem....but keeping it off was my biggest challenge. With Ideal Protein, not only do you lose the weight quicker, but you are taught the basics of good nutrition and how to maintain your new weight goal. My 'coach' Meagan is incredibly knowledgeable and supportive at each weigh in. Even now that I only go in once a month to keep myself on track, she always has words of encouragement to make my goal of maintaining my weight loss possible. The misconception some people have about dieting is 'Ugh, I don't want to eat their food.' I found the variety and quality of the products I had to choose from were delicious and filling! I would look forward to my meals each day because they were simple to make and tasty...perfect to fit a busy lifestyle! With the abundance of healthy choices, not only have I lost the weight but I now have the tools and knowledge necessary to keep it off. My skin looks healthier, my energy level is through the roof, I have my confidence back, and my clothes are prettier! If you're on the fence about giving it a try, don't wait any longer...Ideal Protein has been one of the best decisions I've made in a long time!"